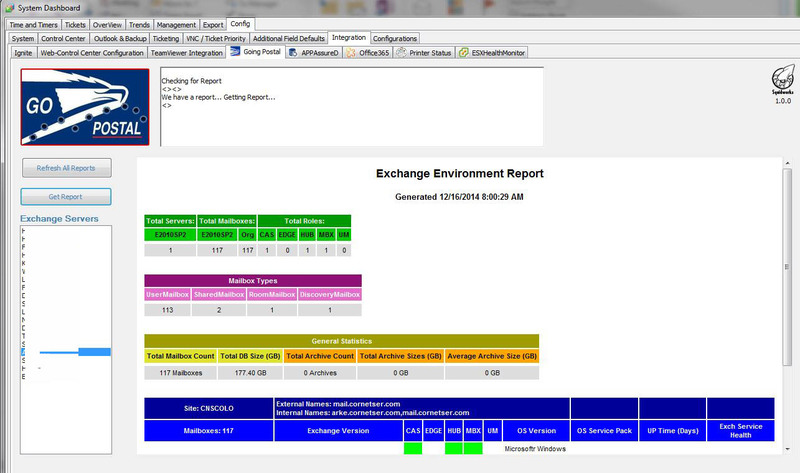 Go Postal is a Microsoft Exchange 2007, 2010 and 2013 reporting plugin for LabTech that uses Powershell to generate reports on each Exchange server being managed by the LabTech RMM platform. The plugin searches all systems for Exchange server software and if it finds a compatible system it adds it to the list of Exchange servers. By selecting an Exchange server you can request the report from that Exchange server in real time and it will retrieve that report directly from the exchange server. Selecting the View Menu from the main menu bar and selecting Go Postal. • O.S Service Pack level. • Up time in days. • Exchange Rollup Update Information. • Number of mailboxes in case of MBX role. • Average Archive Mailbox Size. • Storage Group Name (Pre E2010). • DB Disk Free Percentage. • Log Disk Free Percentage. • Last Full Backup Date. • Backed up Since (Days) – with customized thresholds. • Quota Info: Prohibit Send. • Quota Info: Prohibit Send and Receive. • DB Activation Preference Check [Is it mounted on the preferred Server?]. • DB Copy Location and Activation Preference assignment. The script logs to the script log what user it is running script as.. Make sure this user has the permissions to run the Exchange Powershell console. To test, login as user then open exchange shell (Not in admin mode) and change directory to c:\windows\ltsvc\gopostal\ and run the powershell script that is in directory. Does the output report any errors? Look for failures to write to a folder or read registry.. That seems to be the most common issues which all fall back to permissions. Do you have a default admin user setup in LT for client? ‘We are running as -> ERR: means you have no admin user set as default in the passwords tab of your client. Then under the location console select Deployments & Defaults tab and make sure that the “Login to use for Administration Access” is set to the user name you set in that passwords tab. This user needs to be an exchange and domain admin for scripts to run correctly. With UAC turned off it always opens in admin mode, it does work as expected running manually. The same account I ran it from is the one set as the default in Labtech for the site. This is generated by running a “whoami” at the command line inside the script. If you get a log message like -> “We are running as -> ERR” in script logs then you do not have the location set to use a default admin password. The script must run as a admin so we log who we are running as to make sure we know who we are running as. Exchange Powershell requires this so verify that you have the client and location settings set correctly in LT console. Are you on the LT 10 beta? This is a know issue on that. As of this posting, the current version is 100.324. Please make sure you are on the latest version. Will the next release have the possibility to export these reports from the CC? I know I can get into the LT server and get them out that way. Just to save me a couple of steps.. I got everything more or less working. If i run the script locally in an elevated exchange prompt however running the script either through Labtech or an non elevated prompt i get access error the folder the script is creating. The account is member in both exchange admin and domain admin. The link to download the script is not working. Any way someone could provide me with the script? Thanks. link is now fixed, retry your download. That worked, thank you. I ran this against 2 Exchange 2010 servers and 1 Exchange 2013 server. It reported the Exchange versions correctly for 2010, but reported nothing for Exchange 2013. Any idea? Thanks. I have a simple question before i download this cool plugin. you said that the script will create custom group “Microsoft Exchange Servers”. Would you please tell me if anything will be replaced if i already have this group? That’s a good question, it should not but better safe and export that group as a backup in case you have to restore the settings. We have been using this for a little while.. Love it..
We were wondering if there was a way to schedule a particular server’s report to be sent via email? The plugin displays a server that doesn’t have Exchange installed. How do I remove this server? Hey, thank you for the work you do, I was able to get one report from a server in April, but unable to get any new ones. I also don;t see the SCRIPT Tab has related activity,just the COMMANDS looking for the report. Any tips on this? Il y a visiblement beaucoup de choses à savoir sur cela. Je suppose que vous avez fait certains jolis points en fonctions aussi. the download link is broken again. do you have a new link?